Recreation of 1950’s, 60’s, and 70’s racing steering wheels for: McLaren, Lola, Shadow, March, Chevron, Lotus, Cooper, Elva, Brabham, and others. 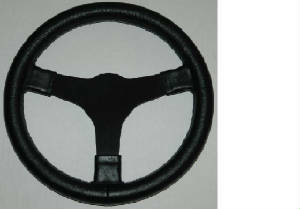 Fitments for: Can-Am, F5000, F-1, USRRC, Sports Racing and Indy cars. The coverings are heavyweight leather that is aniline dyed with medium temper pliability for a good feel. Aniline leather is used because it is dyed completely through and will not fade, crack, or loose pigment like the original wheels. Our wheels are digitized, and water jet cut from original patterns. The rim sections are anodized black or clear, rim sections fitted then hand stitched for a precise fit and firm grip for safety. These wheels will not break down under hard use. 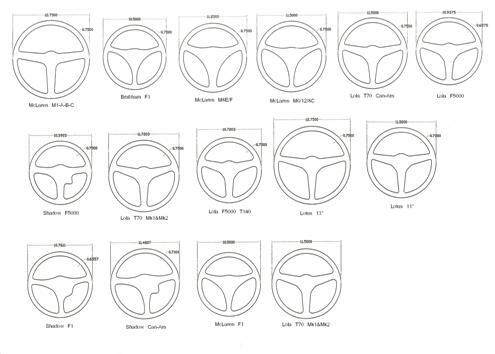 If we do not have a pattern for your wheel we can recreate a wheel from your sample or a fully dimensioned drawing.